Plan a 48-hour visit to Stratford-upon-Avon that takes in all the best this Warwickshire town has to offer. Shakespeare's home town is one of those places that a lot of visitors put on their "must-see" lists without really considering why they want to go there and what they expect to see. The result can be disappointment. This world famous place can seem crowded, overpriced and riddled with tourist oriented clip joints. But it is also one of Britain's (and the world's) cultural treasures. Skip the tourist tat and the fake "attractions" and you can have a memorable and enjoyable visit to the Bard's hometown. And do make sure to include some theater in your itinerary. Matinees are usually scheduled at the Royal Shakespeare Theatre on Thursdays or Saturdays, so if you plan it right, you can take in an evening performance and a matinee with some serious sightseeing as well. and some interesting retail therapy. Ease into day one of the short Shakespeare trip on one of the Hop-On Hop-Off City Sightseeing buses. Even if you are an independent traveler and organized sightseeing tours usually have you running a mile in the opposite direction, you will probably enjoy using the the Stratford-upon-Avon bus, It's different. The guides for the hour-long tour are bright and entertaining. Their patter is full of worthwhile and interesting facts. Did you know that Shakespeare added 3,000 words to the English language? Or that the reason Shakespeare's last home is just a garden is that a neighbour had it torn down for spite? 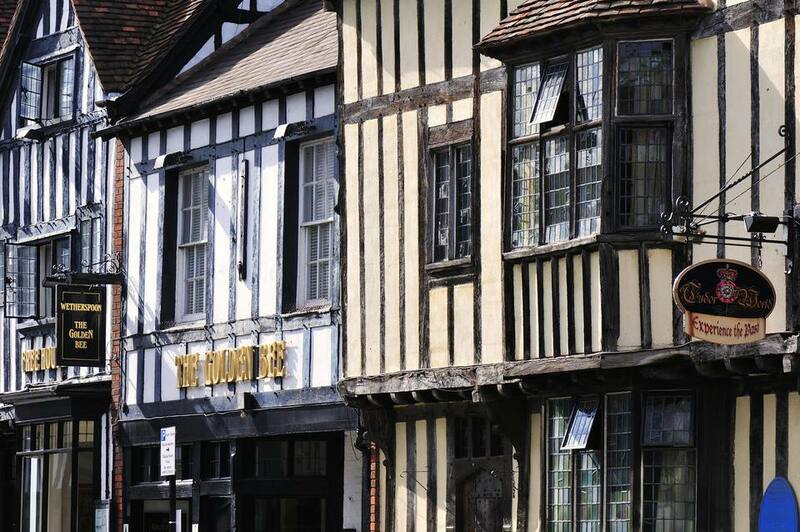 Besides the entertainment value, the bus tour gives a good overview of the town and is the best way of getting to Anne Hathaways Cottage and Mary Arden's House (Shakespeare's mother). Buses leave every 15 to 20 minutes from outside the Pen and Parchment Inn, next to the tourist office on Bridgefoot. Bridgefoot, by the way, is at the foot of Clopton Bridge, built in the 15th century and still the main road into Stratford-upon-Avon. In 2019, a 24-hour ticket cost £15, the bus makes 11 stops. Hop off the tour bus at Anne Hathaway's Cottage in the nearby village of Shottery and spend an hour or so exploring this lovely, famous home. Many people mistakenly believe that Anne pined away here while Shakespeare philandered in London. Actually, nothing could be further from the truth. By the time Shakespeare left to make his fortune, he had three children and they were probably living in the Shakespeare family home in town. It wasn't long before his fame in London was making them one of the richest and most important families in Stratford. Still the romance between the Bard and his much older wife probably started here. Don't miss the Shakespeare Sculpture Garden at the end of the Orchard and get lost in the maze before having a nose round in the excellent gift shop. Then catch the Hop-on Hop-off bus for the short ride to Mary Arden's Farm in Wilmcote. The childhood home of Shakespeare's mother, Mary Arden, is a gabled, and oak-timbered red brick farmhouse (detail inset, above), built around 1570, or before, and occupied as a working farm until as recently as the 1960s. Wilmcote was on the edge of the Forest of Arden, thus the family name. The forest was the setting and inspiration of the romantic comedy As You Like It. Shakespeare's childhood experience of his grandparent's farm and the surrounding countryside probably informed many of the country scenes and rustic characters in his plays. The Arden homestead together with the black and white half-timbered Adam Palmer house next door (until recently wrongly identified as Mary Arden's), illustrate farming life from Tudor times to the recent past. Depending upon when you visit, you might see the farmer's wife preparing food and baking bread from home grown produce, or you might be asked to join in with the farm chores. The farm is home to rare heritage breeds of farm animals as well as a collection of birds of prey. Old English breeds of domestic farm animals, like the red haired Tamworth pigs, Cotswold sheep, and Gloucester Old Spot pigs, are protected and bred at Mary Arden's House and the Shakespeare Countryside Museum. The birds of prey included in the farm's exhibition include buzzards, falcons and owls. They are kept in open pens and are incredibly tolerant of visitors so you can get a very good look. Catch the bus at Mary Arden's for the ride back to town. Back in Stratford-upon-Avon stop off in a food shop to pick up provisions for a picnic lunch on the river. Marks and Spencer on Bridge Street - the main drag through town, is a good bet for interesting sandwiches or more ambitious finger foods and drinks. Then, armed with munchies, make for the river for a lunch break on Day One of this Short Shakespeare Trip. Bancroft Cruisers leave four times a day from a landing stage at the Crowne Plaza Hotel, Bridgefoot, for a 45 minute cruise. Tickets in 2019 cost £7 for adults, £4.50 for kids. Avon Boating does 40 minute cruises in Vintage Edwardian passenger boats. Cruises leave hourly every day from April 1 to October 31 from Bancroft Gardens, next to the Royal Shakespeare Theatre and in 2019 cost £7 for adults, £5 for kids, with family tickets and concessions available.. Boarding starts 20 minutes before departure. You can buy your tickets onboard or book on the website. There are digital audio guides available free of charge or you can simply enjoy the peaceful river cruise undisturbed. Narrow boats ply the Stratford-upon-Avon Canal to where it joins the River Avon in Stratford. A combination of transportation and vacation accommodation, England's narrow boats are a romantic way to discover scenic riverside villages pubs. The Stratford-upon-Avon Canal is a 25 mile canal with 56 locks between Birmingham and and Stratford-upon-Avon. It forms part of a longer route known as the Avon Ring. Narrow boats can berth free at public moorings, across from the Royal Shakespeare Theatre, for 48 hours, on a first come-first served basis. There's probably no time to get aboard a narrow boat during this 48-hour itinerary. Just enjoy their scenic charm for now. Waterside is the road that runs along the Avon on the Shakespeare Theatre side. There is more than enough to see and do along this to spend a pleasant afternoon. Start out with a visit to the Swan Gallery in the Swan Theatre - the original Shakespeare Memorial Theatre built in 1874. Stroll down to the Other Place - the Royal Shakespeare Company's studio theater, rehearsal space and costume store. It reopened to the public in April 2016 with a new Page to Stage backstage tour - one of several behind the scenes tours you can join during your visit. Tours costs £9 or £5 for under 18s, with a front of house tour costing slightly less. The tours include first-hand accounts from directors and actors, a chance to see how costumes and props used in rehearsals can influence the performance, and a look into the RSC's costume hire storage with a chance to handle some interesting pieces. This is a great experience for any starstruck young people in your party. The Other Place also has a pleasant, casual cafe. Continue along Waterside, past the Royal Shakespeare Theatre, to find this unusual chain ferry across the Avon. It was built in 1937 and is the last of its kind in Britain. A hand crank turns a chain mechanism to propel it across the river. For 50 pence you can have an unusual ride and, perhaps, a chance to man the chain crank yourself. Just past the chain ferry, Waterside turns into Southern Lane and begins to curve away from the River. Find Hall's Croft on Old Town, the first right. Shakespeare's daughter, Susanna, married Dr. John Hall, a distinguished physician. Hall's Croft was their elegant marital home. Here you'll learn how a wealthy family lived in the late Tudor and early Jacobean period. The large rooms and wide expanses of glass were signs of this family's affluence. Dr. Hall was famous in his own right for discovering and prescribing a herbal cure for scurvy, about 100 years before British Naval Physicians began prescribing limes for the vitamin C deficiency disease. His case book, collected and published after his death, provides insight into the practice of a provincial doctor. Dr. Hall's consulting room at Hall's Croft has an exhibition of artifacts, notes and medical tools. Visit Hall's Croft and stop in the pleasant tea room for a cuppa. Do some carb loading too, so that you can hold out for an after theater supper. Shakespeare was both baptised and buried in Holy Trinity Church, on the Banks of the Avon. The priviledge of burial within the church arose not from his fame as a playwright but from the fact that he owned a share of the the tithe income privileges, bought for £440, when Henry VIII abolished the College of Cardinals in Britain. With the priviledge came the duty of employing a priest and looking after the Chancel as well as the right of burial there. His wife, Anne Hathaway, daughter Susanna, son-in-law Dr John Hall and Thomas Nash (first husband of his grandaughter Elizabeth) are buried beside him. The church dates from the early 13th century and it is likely that a wooden church existed on the site as early as the 9th century. Organ music was played here before the reformation, but the magnificent organ pictured here was built and rebuilt from 1841 all the way up to 1991. The Church is open to the public during fixed hours but subject to closure for weddings, funerals and special events. Scheduled closures are listed on the Holy Trinity website. Normal visiting hours between October and March are 10 a.m. to 4p.m. and from 9 a.m. to 5 p.m. during the summer months. Last admission is 20 minutes before closing and Sunday opening hours are scheduled around worship services. Entrance to the church is free but there is a suggested donation of £3 (students and seniors £2) for visiting Shakespeare's grave. From April 1, 2019 the suggested donation will go up to £4. Shakespeare is buried just below the altar in the Chancel of Holy Trinity Church, Stratford-upon-Avon. A bust of Shakespeare, in the wall beside the grave was set up about seven years after his death and within the lifetime of his wife, Anne Hathaway. Its tanned and vaguely piratical appearance is said to be a good likeness of the Bard. In Shakespeare's day it was customary to move bones from the graveyard, and the tombs within the church, into a charnel house to make way for more burials. From time to time, the bones in the charnel house were burned. This was commonly known as the bonefire (thus bonfire) of the vanities. A rubbing of the inscription is displayed on the tombstone. The Dirty Duck is about 100 yards down Waterside from The Royal Shakespeare Theatre. This popular Stratford-upon-Avon pub is must for theatre-goers or anyone else who enjoys a friendly drink in a picturesque pub. It's spread over several rooms, plus a rear garden and front terrace, of a 15th century building that has been a pub since at least the 1700s. Stop in for a pre-theater drink and book a table for supper after the show. They take last food orders at 11 p.m. Chances are you will see half the cast of the play having their after show meal there as well. Stick your nose in the Actor's Bar, a plain room that is probably as close to the original 18th century decor as you can get - except, of course, for the pictures. The room as absolutely papered with autographed photos of Royal Shakespeare Company luminaries going back decades. You may notice that the sign board, visible in this picture, says "Flowers". That's the brewery once associated with this pub. - though it is now a Greene King pub. It is also the family that first donated land and money to build a Shakespeare theater here in the Victorian era and who continue to support the RSC to this day. Food is simple bistro fare - pasta, burgers, bangers and mash - and frankly, it is nothing to write home about. But it is decent and reasonably priced. Besides, it's the people watching and the friendly atmosphere that make this place so much fun. It's curtain up at 7:30 p.m. for a Royal Shakespeare Company production. For as little as £5 (open understudy rehearsals), it's the best value theater ticket money can buy. Shakespeare's birthplace and childhood home is on Henley Street in the center of Stratford-upon-Avon. His father, John, was a man of substance who worked as a glover, a lucrative trade in Tudor times. The house on Henley Street, authentically furnished and hung with richly colored cloths, reflects his position during Shakespeare's childhood. His glover's workshop has been recreated in the house. The house, where Shakespeare also spent the early years of his married life with Anne Hathaway, has been a visitor attraction for more than 250 years. A guest book records such distinguished visitors as Charles Dickens, John Keats, Walter Scott and Thomas Hardy. An exhibition, next door, has rare artifacts of the period as well as a copy of the first folio of his plays, published in 1623. Visit Shakespeare's Birthplace, then spend the rest of the morning exploring Stratford-upon-Avon's historic streets. Everywhere you turn, Stratford-upon-Avon is full of original half-timbered, black and white buildings. The Shakespeare Hotel, pictured here, is a Grade I listed building -- the highest architectural preservation listing in the UK. The Church Street Almshouses - A row of 16th century houses built for the poor and still in use as low-cost housing for the elderly. King Edward VI Grammar School Shakespeare's boyhood school. Today it is what is known as a voluntary state aided grammar school - a selective, state funded school, free to students who are admitted. The old buildings, where Shakespeare was probably a pupil, are still in use. Explore the small cluster of streets around the center of Stratford upon Avon, to find more of its black and while treasures - in use for such mundane purposes as liquor stores and real estate offices. Around noon, take a break and stop for lunch. The town has plenty of informal sandwich shops where you can grab a quick bite. For better value, head to the Royal Shakespeare Theatre where there are several different, reasonably-priced RST cafes and restaurants (including outdoor eating at the Riverside Cafe) open on performance and non-performance days. If you're planning to attend a matinee they make convenient choices. How often will you be back? And when will you next see so many top actors for such low ticket prices? Don't waste a minute - take in another show. Royal Shakespeare Company matinees, on Thursdays and Saturdays, usually start at 1:30. Ticket prices vary but start at about £16. The very best seats in the house can cost £70 or more but plenty of moderately priced tickets are available. If you've never been to the RSC before, try for a First Time Friday ticket for only £10. A limited number of them are available for every Friday performance. See what's on at the RSC. The Garrick Inn, the double gabled building with curving timbers, is in a building that dates from 1595 and has been an Inn since the early 1700s. It's possible there was a pub on this site as early as the 14th century. The taller building, next door, with the straight timbers, was the home of Katherine Rogers, mother of John Harvard-the founder of Harvard University. 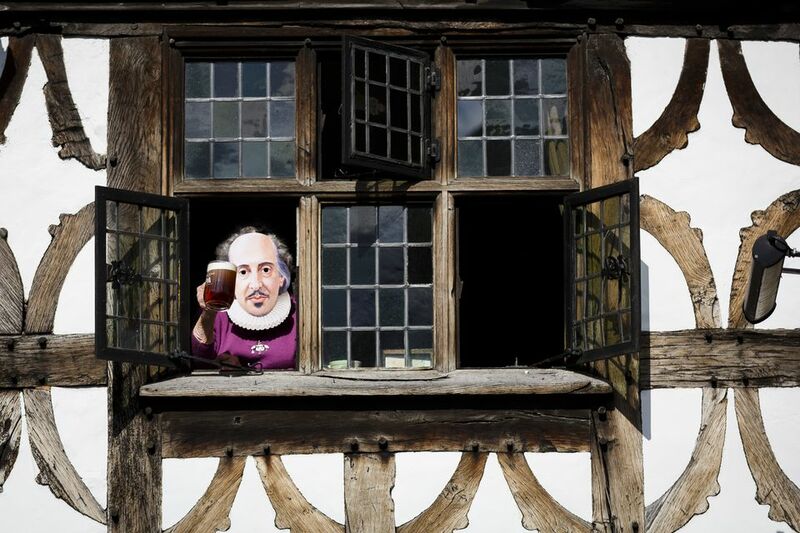 Owned by Harvard University, it has been managed by the Shakespeare Birthplace Trust since 1990. The house is not currently open to the public. The Garrick Inn was named for Shakespearean actor David Garrick after he organized the Shakespeare Jubilee in 1760. Until recently, its other major distinction was that this was the only non-smoking pub in Stratford-upon-Avon. But on July 1, 2007, all enclosed public places in England became smoke-free. Have a drink, a beer or a soft drink here before moving on to dinner on Sheep Street, Stratford-upon-Avon's restaurant row. No visitor destination in the UK would be complete without a big, multi-stall antique center. Who knows if anyone ever finds a bargain but that's not really the point, is it? If you like poking around a mixture of crafts, collectibles and junk, looking for potential treasures, they are irresistable. Stratford has several multi-story, multi-dealer antiques markets and emporia. Look for them on Ely Street, Henley Street, Sheep Street, The Minories and Windsor Street.